Belgian beers are, without a doubt, the most unique of all the beers that are made around the globe. Their infamous yeast strains not only create alcohol and carbonation but also impart fruity, spicy and funky flavors that are not normally present in beers from outside its Western European walls. The Belgian-style tripel ale is one of the more complex ales that people either cherish or loathe. Its high alcohol content, sugary sweetness and spicy yeast profile make it a hot topic for beer geeks and noobs alike. 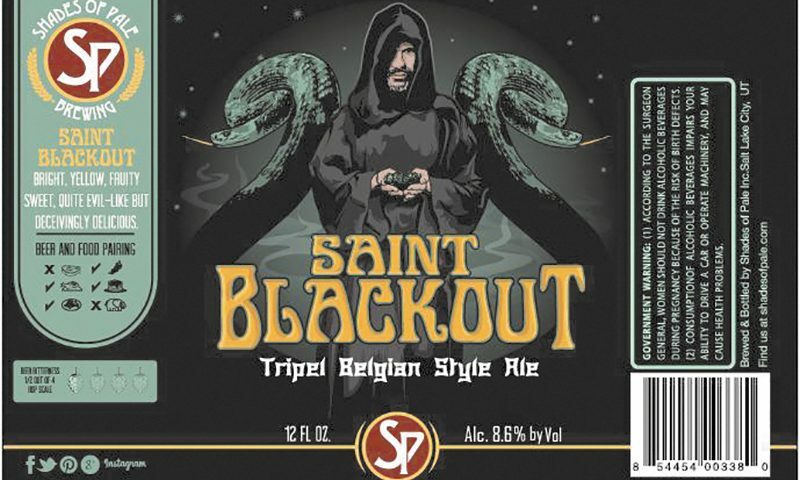 While there are a few locally made Belgian-style tripels floating around the Utah market, there are not many that are available year-round and fewer still that have the high level of drinkability that is commonly associated with big, boozy beers of this style. 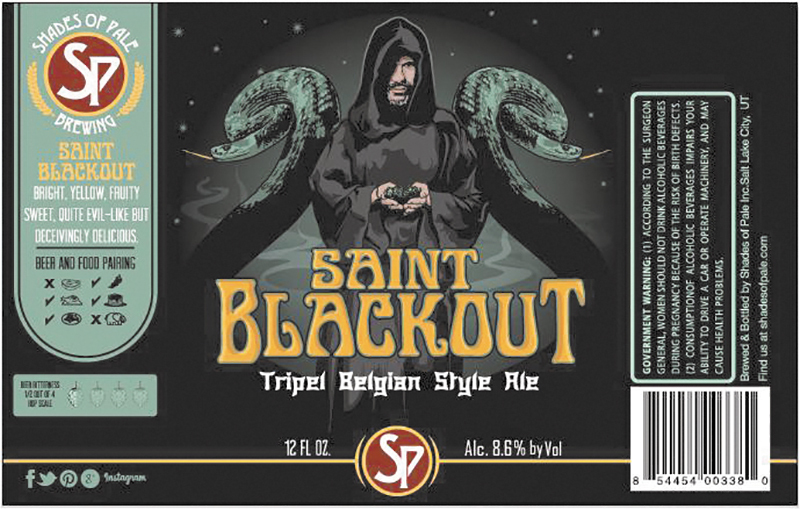 I came across the Saint Blackout Tripel Belgian Style Ale from Shades of Pale Brewing. Tripels are typical for this particular brewery, so I was curious to see if this local Belgian interpretation has that year-round enjoyability factor. Description: At first glance, as I work my eyes around the bottle, I’m trying to verify that I am about to delve into a Belgian-style tripel and not an imperial stout. The label does suggest a dark and foreboding beer. As it leaves the bottle into my glass, I’m happy to see a brassy banana color that is cloudy and barely translucent. The carbonation reveals itself as two fingers’ worth of foam begins to build around the narrow rim of my bowl-shaped chalice. It begins to subside quickly to a cap of foam protecting the liquid below. As I get my nose in the somewhat narrow opening, there are yeasty spices with some bright tree fruits. I was expecting a whiff of alcohol and more potent phenolic clove aromas, as is common with this style of beer—I was happily surprised to find a light nose with little to no burn and pleasant, candy-like spices. Wheat dough is barely perceivable but present, adding to the subtle aromas. As I wash the bright-yellow beverage across the tongue, I find that malts are more assertive than my nose had led me to believe. Chewy Euro-style breads lay down a foundation that begins a quick transition to a barrage of flavors that pull the tongue in multiple directions. Candied-sugar sweetness asserts itself right off the bat, bringing with it bread pudding, fig and banana. Big orchard peaches come in next to dominate the palate. I’m used to a little peach flavor in a tripel ale, but this example takes it to a much fruitier level. Bubblegum and citrus peel round out the back of the palate, creating a smooth, mild and somewhat refreshing end. The finish leaves the tongue a bit dry and cool, even though the ABV is upward of 8.6 percent. The carbonation is just below the prickly side of the effervescence, which adds to the body of the beer, as it seems slightly thin for the style. Overview: This was the first real Belgian-style ale to come out of Shades of Pale. It’s easy to see how a brewer unaccustomed to brewing Belgian-style beers could play it safe and not let the beer turn into a flavor bomb. The natural-tasting peach flavors that are present here make this a highly drinkable, juicy and approachable ale for those who may not be accustomed to—or like—Belgian tripels. I’d like to see what a year in the bottle does for this beer. While it may not be 100-percent true to style, this is a tasty ale and one that I would gladly drink again. You can find this Belgian tripel at Shades of Pale’s bottle shop, or enjoy it at their full-service brewhouse taproom located at 2160 S. West Temple in Salt Lake City.